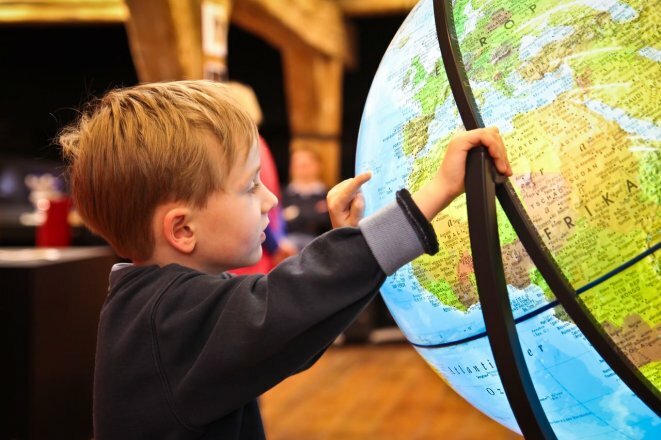 During the winter holidays, terra mineralia will be greeting young guests with the words, ‘Welcome to the Ice Age!’ Young boys and girls will be learning which people and animals lived in Europe during the last ice age and how glaciers, ice and snow shaped the landscape. The children will travel 10,000 years back in time to the end of the glacial period, which also coincided with the end of the Old Stone Age. Europe was still partially covered with large glaciers and was far cooler than today. Was that the end of the Ice Age? No. Because ‘ice age’ means that glacial and interglacial periods alternate. Even now, we’re still in an ice age that has now lasted 2.7 million years. 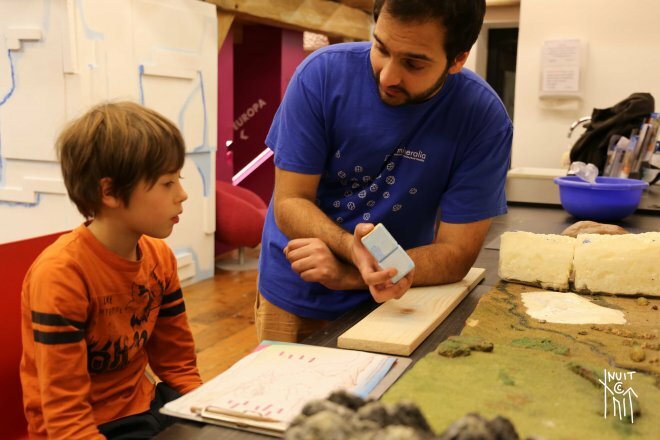 On a tour through the exhibition, children will be able to learn through play what exactly an ice age is and what its relationship was to the Old Stone Age. They’ll learn that before modern humans, Neanderthals and Homo erectus lived in Europe. Our ancestors used stones and minerals as tools, hunting weapons, or for producing paint. They were even able to kindle fires with them! Typical Ice Age animals included mammoths and woolly rhinoceroses, but horses and reindeer were hunted, too. And which of these animals are still alive today? In the Voyage of Discovery, our science centre, lots of exciting experiments about glaciers are awaiting the children. How is a glacier formed? What is its structure? How does it move? Just how heavy is one of these glaciers? What changes brought about by glaciers can still be seen today? And, finally, we’ll be answering the question, how can we tell today that the great glaciers of the Ice Age really existed? 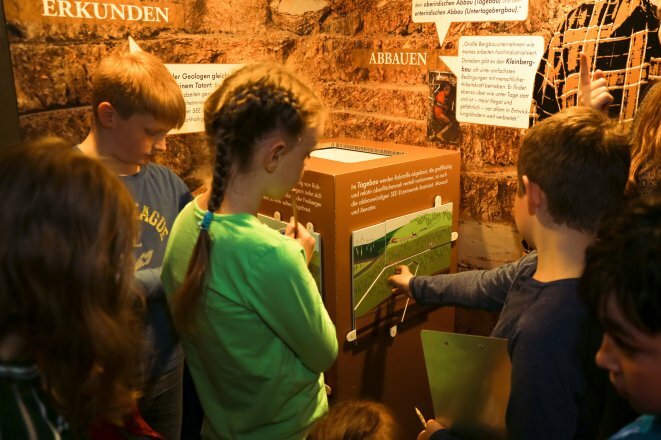 Students at TU Bergakademie Freiberg will show children the world of 10,000 years ago and will conduct experiments together with them. When the boys and girls have answered all the questions, they can pay a visit to our craft cave. The wall of this Stone Age cave needs to be decorated with cave paintings. Even in those days, the paint pigments used came from minerals. Anyone who wants to can make themselves a little leather purse as a memento. Just like our ancestors probably did. The terra mineralia winter programme, ‘Welcome to the Ice Age!’, is open daily from 11–26 February 2017, between 10am and 5pm. Please allow around 1½ hours for your visit. Visits can be started at any time. Kids and day-care groups are requested to register in advance. Last entry is at 3.30pm at the latest. For more information, please contact the terra mineralia Info Desk on 03731 394654 or fuehrungen@terra-mineralia.de. Kids clubs and day-care groups must register in advance. Come into the Voyage of Discovery and get trained as a detective! You’ll learn how to take and interpret fingerprints, how to look for clues, and how to decipher secret codes. Analysing hair samples, threads, and stain and splash marks completes the training. Using this knowledge, you can really help Gecko Gustav as he searches for his hiding stone! 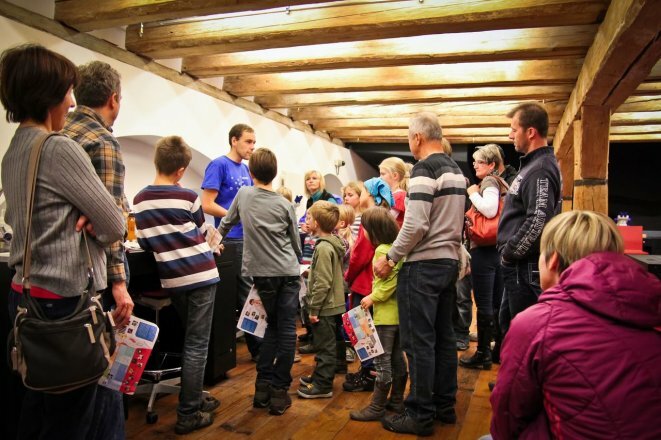 Children from 7 years upwards can discover the special exhibition with Gecko Gustav. The little lizard lives with renowned scientist Kathrin Bauer. In his terrarium, Gustav has a cosy hiding stone – it’s his favourite place! One day, the professor took this hiding stone to a very important meeting at terra mineralia. She was murdered there and the hiding stone disappeared. Help Gecko Gustav and the police with their enquiries to reveal the secrets of the hiding stone and even solve the murder mystery. In the holidays from 24 June to 6 August 2017, families have the chance to investigate a crime together at terra mineralia. Our special exhibition ‘CSI Freiberg. Murder at terra mineralia’ is aimed at visitors young and old. The body of renowned scientist Kathrin Berg has been discovered amongst the beautiful minerals. She’s an expert in rare earth elements. But who’s behind this misdeed? 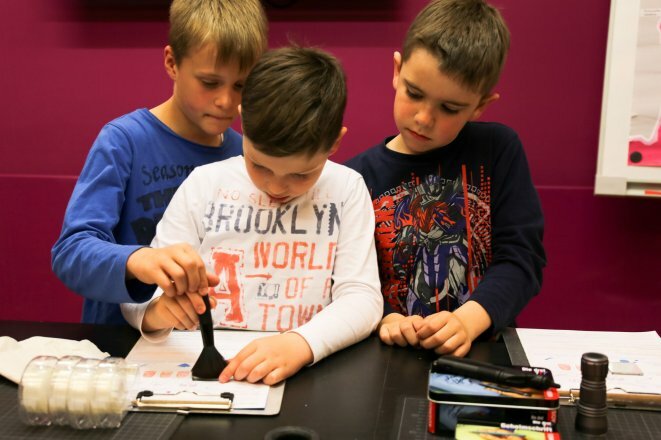 Visitors will carry out their investigations like a real detective, learning as they search for the murderer about the rare earths that we need for all sorts of things in our everyday lives. Children from 7 years upwards will carry out their investigations along with Gustav Gecko. Gustav is a little lizard who lives with renowned scientist Kathrin Berg. In his terrarium he has a cosy hiding stone, his favourite place in the world! One day, the professor takes the stone to a very important meeting at terra mineralia. But neither returns… Gustav Gecko decides to set out in search of them. Along the way, he discovers that his stone is special because it has rare earths in it. Now he’ll have to proceed like a real detective. This way, he’ll help the police with their enquiries so he can clear up the mystery of the hiding stone and even solve the crime. 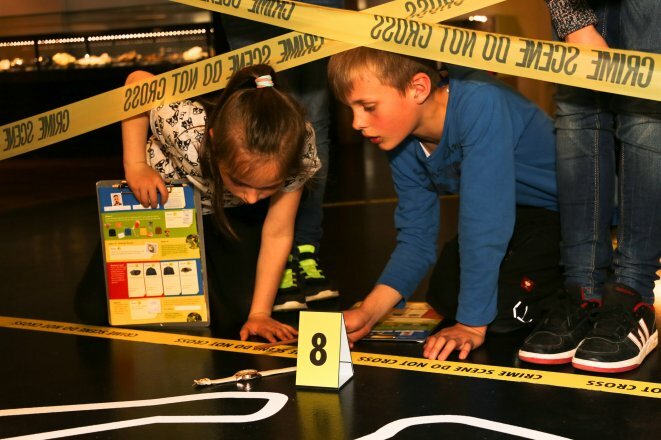 In the Voyage of Discovery, the exhibition’s science centre, boys and girls can also train as a detective. They’ll learn how to take and read fingerprints, how to search for clues and how to crack secret codes. The detective training also covers analysing specimens of hair, threads, and samples of marks and stains. With this knowledge, any child can be a brilliant help to Gustav Gecko as he searches for his hiding stone! The ‘Gustav Gecko is looking for his stone’ holiday programme and detective training will take place between 10am and 5pm, Thursdays to Sundays from 24 June to 6 August 2017. Nursery and kids club groups are requested to register in advance. For more information, please get in touch with the terra mineralia Info Desk on 03731 394654 or by email to fuehrungen@terra-mineralia.de. Easter Holidays (14 – 23.04.2017), Ascension/Pentecost (25 – 28.05.2017, 3 – 5.06.2017): Special exhibition “CSI Freiberg. A murder mystery in terra mineralia” accompanying programme during the holidays: detective training and Gecko Gustav is looking for his stone. This programme will be offered every weekend until the 26 November 2017. Hard to believe, but it’s true: there are minerals inside of us! Set out on an exciting quest and find out what the minerals in our body do. You’ll also get to know minerals that enable robots to walk and mobiles to make calls. There are loads of experiments waiting for you in the Voyage of Discovery. You’ll be able to test what our bones, blood and skin would look like without minerals. 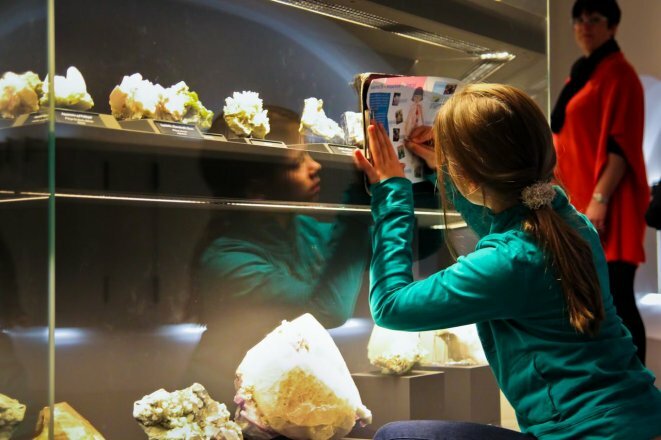 It’s the minerals in our bodies that we focussed on over the autumn holidays at terra mineralia, TU Bergakademie Freiberg’s permanent exhibition. 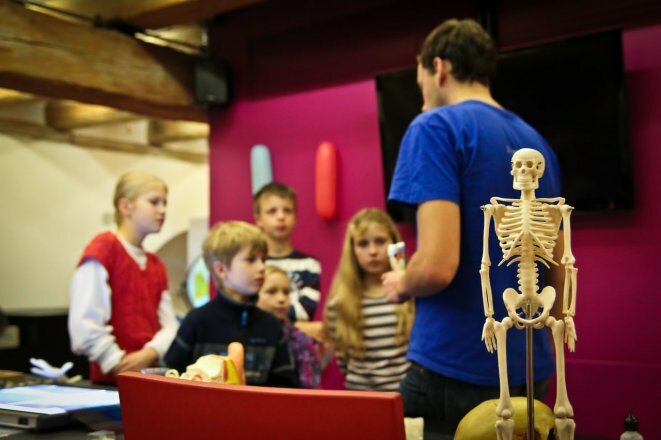 Every day from 10am to 5pm between 30 September and 15 October, young mineral enthusiasts learned what minerals there are in the human body, and what they do there. This programme will be offered every weekend (Saturday and Sunday) until 26 November 2017. 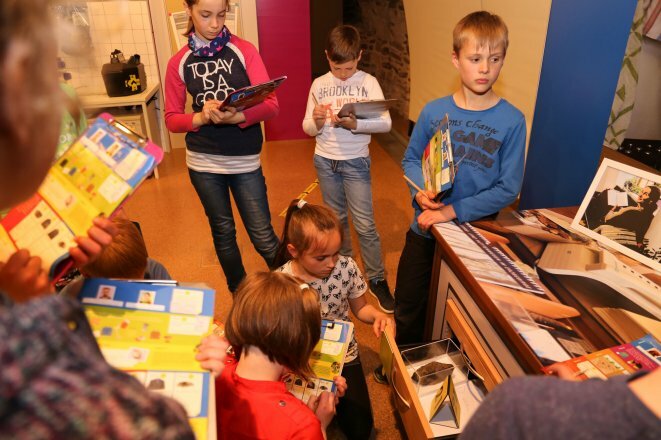 Visitors young and old will be able to take a fun-packed journey through our exhibition, learning about the minerals in question as they go. It’s minerals, for example, that stabilise our teeth and bones; we need them for maintaining our equilibrium and for helping us to see. We can taste some of them on our skin when we sweat; our blood is red because of others; and some even make us sick. 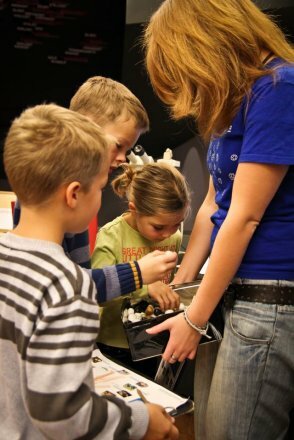 Each mineral in the exhibition features an interactive station where girls and boys can solve riddles and make their own little discoveries. As always, the journey continues in the “Voyage of Discovery”, terra mineralia’s hands-on lab. 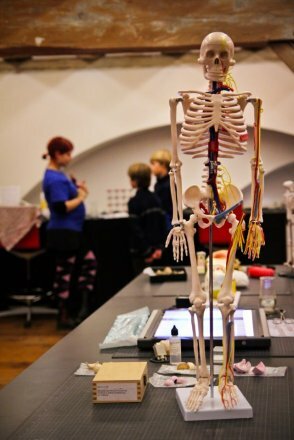 Here, TU Bergakademie Freiberg students will be ready and waiting for the kids with experiments that are sure to surprise and amaze. And, of course, there’s plenty of scope for joining in! But that’s not all you’ll find there. We’ll also have a life-size pop-up house where our young explorers can learn what minerals we need for day-to-day life. We’ve labelled all of the items here that would be practically inconceivable without minerals. We’d have no mirrors without silver, for example, no windowpanes without quartz, and no mortar without gypsum. And as a special guest over the autumn holidays, we’ll have a small robot for visitors to meet. With his help, visitors will learn about different mineral materials that bring him to life. There’s no need to register to take part in our programme and you can start at any time. Day-care groups and kids clubs are however requested to register in advance. Please allow about an hour and a half for visits to our autumn holiday programme. For more information, please contact the Info Desk (open Mon–Thu, 10am–3.30pm) on 03731 394654 or at fuehrungen@terra-mineralia.de. During the Christmas period from 22 November to 23 December, visitors young and old will be able to experience a very special trip to the museum. Armed with a head torch and a UV flashlight they’ll be able to explore terra mineralia by dark Wednesdays from 5pm and Saturdays from 6pm. One of the things they’ll be able to discover is fluorescent minerals that glow in all sorts of colours. This extraordinary phenomenon is known as luminescence. At terra mineralia, there’s a special room where you can admire the minerals ‘glowing’, the Journey into the Light. Here, selected minerals are illuminated with ultraviolet light. It’s a part of the sun’s light that has so much energy it gives people sunburn, but it also causes some minerals to glow spectacularly. 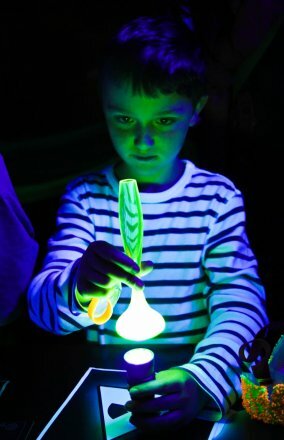 This exciting tour through the darkness of the exhibition will give families the opportunity to see up close the different colours that different minerals fluoresce in. 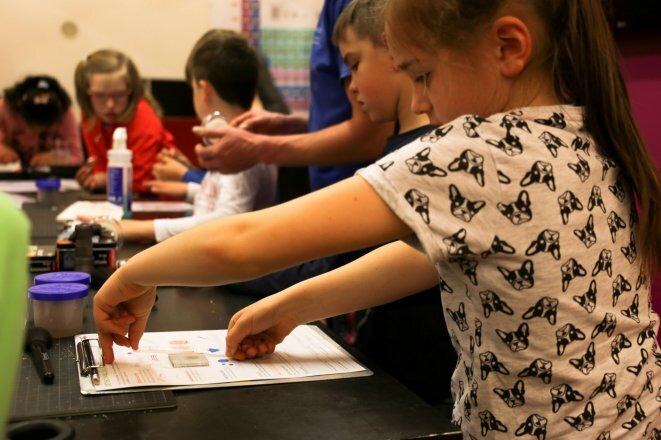 In the Voyage of Discovery, terra mineralia’s hands-on laboratory, boys and girls will have the opportunity to get to the root of the phenomenon of fluorescence. 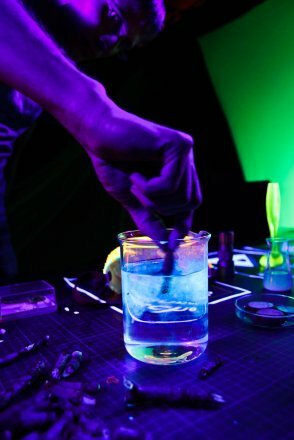 We’ll have a range of experiments available to show the children what light is actually made of, where the ultraviolet light comes from that our human eyes can’t detect, and which forces can cause luminescence. Research was also carried out at TU Freiberg into the fluorescence effect, named after the mineral fluorite. Renowned Professor Friedrich Mohs, for example, conducted experiments into fluorescence in 1824. The Night-time in the Museum family tour lasts around 90 minutes. Registration is already open. Adults pay €15 and children €10. Family card €35. Further information is available from the Info Desk (Mon–Thurs, 10am–3.30pm) on 03731 394654 or by email to fuehrungen@terra-mineralia.de. Minerals come in a huge variety of colours that are easily recognisable at first glance. But some minerals also bear a colourful ‘secret’ that they only betray under particular kinds of light. These minerals reveal an almost magical glow when they’re exposed to ultraviolet light. It’s a phenomenon you don’t only see in minerals, but also in living creatures like scorpions and glow-worms, and even in washing powder. Ultraviolet light is rich in energy. Human beings can’t see it, but we can feel it on our skin – it’s what causes sunburn. 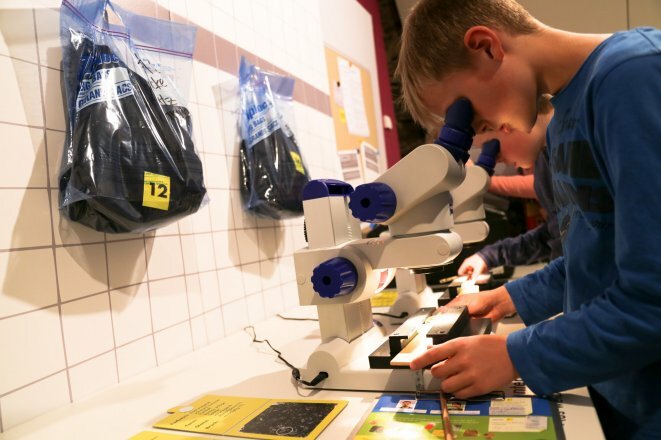 In the Voyage of Discovery, terra mineralia’s hands-on laboratory, TU Bergakademie Freiberg students will be demonstrating a variety of experiments on fluorescence. The experiments will give visitors young and old alike the chance to see where and how this beautiful effect arises in minerals. They’ll also be able to illuminate various minerals with UV torchlight themselves to see what colours are revealed. Other experiments will demonstrate how you can make chicken’s eggs, chestnuts and even puddings glow. You’ll even be able to see fluorescence in scorpions, tonic water or banknotes! 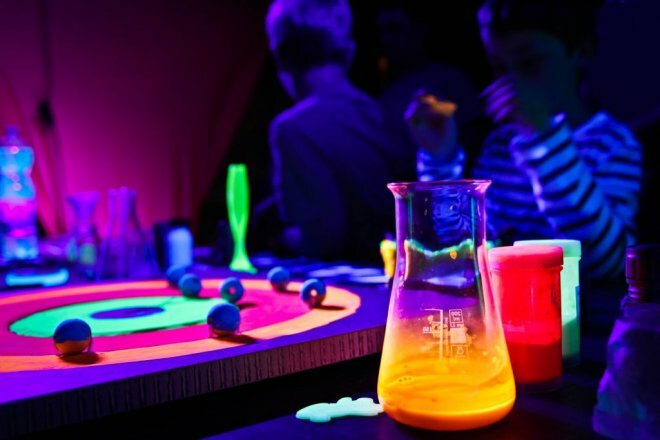 Fluorescence experiments in the Voyage of Discovery – terra mineralia’s hands-on laboratory – take place from 27–30 December 2017 and 2–7 January 2018, from 11am–5pm on a rolling schedule.